The Fiat G.55 Centauro (Italian: "Centaur") was a single-engine single-seat World War II fighter aircraft used by the Regia Aeronautica and the A.N.R. (Aeronautica Nazionale Repubblicana) in 1943-1945. It was designed and built in Turin by Fiat. The Fiat G.55 was, probably the best type produced in Italy during World War II, but it did not enter production until 1943. 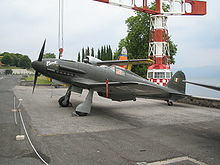 During its short operational service, mostly under the Repubblica Sociale Italiana insignia, after the 8 September 1943, this powerful, robust and fast aircraft proved itself to be an excellent interceptor at high altitude. In 1944, over Northern Italy, the Centauro clashed with British Supermarine Spitfire, P-51 Mustang, P-47 Thunderbolt and P-38 Lightning. Italian fighter pilots liked their Centauro but by the time the war ended, only less than 300 had been built. By 1939, all the main Italian aircraft factories had begun designing a new series of fighter, with inline engines as opposed to the radial engines that powered the Italian fighters in early World War II. This process brought to the first generation of Italian fighters equipped with the Italian-built copy of the Daimler-Benz DB 601 engine, the so-called Serie 1/2, whose most prominent representative was the Macchi C.202 Folgore. However, the process didn't stop, and already in 1941, designers shifted their attention on the new Daimler-Benz DB 605. Fiat designer Giuseppe Gabrielli, while experimenting a new version of his Fiat G.50 fighter, equipped with the DB 601, started a new design that was to be powered by the Daimler-Benz DB 605. The first G.55 prototype flew on 30 April 1942, piloted by commander Valentino Cus, immediately showing its good performance and flight characteristics. It was armed with one 20 mm MG 151/20 cannon, installed in the hub with 200 rounds, and four 12.7 mm (.5 in) Breda-SAFAT machine guns, two in the upper engine cowling and two in the lower part, with 300 rpg, in "Sottoserie O" airframes. This layout soon proved to be troublesome, both for rearming and for the servicing of the lower cowling mounted machine guns: for this reason, the two lower machine guns were removed, and replaced with a 20 mm MG 151/20 in each wing, in the later production series, the Serie 1. The prototype flew to Guidonia, where it was put into trials against the other fighters of the so-called Serie 5 Macchi C.205V Veltro and the formidable Reggiane Re.2005 Sagittario, all of them built around the powerful Daimler-Benz DB 605 engine. The trials showed that the Centauro was the 2nd best performer overall, and it won the tender set by the Regia Aeronautica. The C.205V was good at low and medium altitudes, fast and with good diving characteristics but its performance dropped considerably over 8,000 m (26,250 ft), particularly in handling. The Re.2005 was the fastest at high altitudes and best in dogfights, but suffered from a vibration which turned out to be a balance problem, this was corrected, but was still the most time consuming and technically advanced of the three to produce. The G.55 was chosen for mass production. The G.55 prototype reached 620 km/h (390 mph) full loaded without WEP (war emergency power), at 7,000 m (22,970 ft), a little less than expected, but had a strong airframe and was the best one regarding handling and stability at every altitude. The only negative assessment noted by G.55 pilots was the pronounced left-hand yawing at takeoff. This was partially remedied by a slight offset positioning of the vertical stabilizer to counteract engine torque. Picture - A Fiat G.55 with ANR livery exhibited at the Museo storico dell'Aeronautica Militare di Vigna di Valle, on Bracciano lake, in Lazio region. By early 1943, increased Allied bombing raids over Italy had showed that there was no suitable high-altitude fighter to deal with them effectively. The Macchi C.202's performance decreased above 8,000 m (26,250 ft), the typical altitude of the bombers and the MC.202's armament of two 12.7 mm (.5 in) machine guns was hardly adequate to bring down the large American bombers. Of the Serie 5 fighters, the Centauro showed the best high altitude performance, due to its large wing surface area. Also its powerful armament, along with the generous ammunition supply (the G.55 had 250 rounds of 20 mm ammunition in the hub cannon as opposed to 120 rounds in the Re.2005) standardized in the production Serie I, was enough to bring down the US bombers. The Regia Aeronautica commissioned the production of 1,800 G.55s, later raising that number to 2,400. 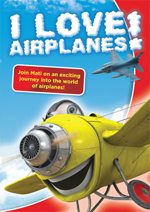 A pre-production series of 34 examples was ordered: these aircraft were mostly based on the prototype, with minor changes to improve its flying characteristics. They had a different weapon layout, as stated above, with the two lower cowling machine guns moved into the wings. Only 19 of the 34 commissioned aircraft were built, and six of them were converted to the Serie I standard at the factory. From that date on, the Centauro served with the Aeronautica Nazionale Repubblicana (ANR), the air force of the fascist state created by Mussolini with the Germans' help in North Italy. It still not exactly known how many "Centauros" were eventually requisitioned by the Luftwaffe or those acquired by ANR. About 18 aircraft were expropriated by the ANR while 12-20 (but according to some official reports, 42) were requisitioned by the Germans. The Fiat factory, in Turin under German control, continued production for about six months and when on on 25 April 1944, Fiat factories were heavily bombed (15 G.55s were destroyed with some three-engined transport G.12s, BR.20 bombers and CR.42LWs ordered by the Luftwaffe), 164 "Centauros" had been completed, 97 of them being produced after the Armistice and delivered to ANR. Following the advice of Rustungs und Kriegsproduktion Stab (RuK), the German Control Commission, production was dispersed in small cities of Monferrato and production of parts were assigned to CANSA of Novara and AVIA in Vercelli. The parts were then assembled in Turin where the aircraft were to be flown by test pilots Valentino Cus, Rolandi, Agostini and Catella. Production slowed markedly, and was stopped by the German authorities in September 1944. A total of 148 G.55s were delivered to the ANR and, when the factory was captured, 37 more examples were ready, while 73 were still on the production line, in various degrees of completion. The first Centauro to see operational use was the third prototype. On 21 March 1943, the aircraft was assigned to 20� Gruppo (squadron), 51� Stormo (wing) CT, based on Roma-Ciampino, for operational evaluation. In May, the G.55 followed the unit to Capoterra, near Cagliari having its baptism of fire on 5 June 1943, against Allied aircraft attacking Sardinia. The two first pre-production series flew, respectively, on 10 April and in May 1943. In early June they were assigned to 353 Squadriglia (flight) CT based in Foligno, Umbria, were, until August, were transferred nine more aircraft. Pilots were delighted when they began to receive the new fighter in summer 1943. In June, the first Serie I were assigned to Gruppo Complementare of 51� Stormo in Foligno, near Perugia, but in July the 11 G.55 of Gruppo Complementare were transferred to 353a Squadriglia, that already had in charge the "pre-series" machines, to operate from Roma-Ciampino Sud airfield. The 353a Squadriglia, commanded by Capitano Egeo Pittoni, flew many missions against the American bomber formation, but the flights were stopped when Rome was declared "Cittx� aperta" (Open City). On 27 August, the Squadriglie 351a and 352a left Sardinia and arrived in Foligno to be re-equipped with G.55. But at the date of the 8 Septempber the G.55 had not been delivered yet. During the first week of September, 12 Centauros had been assigned to 372a Squadriglia of 153� Gruppo in Torino-Mirafiori. On 8 September 1943, the date of Armistice, the Regia Aeronautica had received 35 G.55s. Only one of them flew to southern Italy, accepting the invitation of Maresciallo d'Italia Pietro Badoglio to surrender to Allied forces. There still is not exact data about the G.55 captured by Luftwaffe or acquired by Aeronautica Nazionale Republicana. About 18 G.55s were acquired by ANR while 12-20, or even 42, according to some reports, were requisitioned by the Luftwaffe. The Centauro entered in service with the ANR; a decision was made to produce 500 G.55s, of which 300 were G.55/I and 200 G.55/II Serie II, armed with five 20 mm MG 151/20s and no machine guns. Only 148 were delivered to the ANR units that, as the number of available G.55s dwindled, were progressively re-equipped with the Bf 109G, of various sub-versions, even though Italian pilots preferred the G.55 with cancellation of production being extremely unpopular. 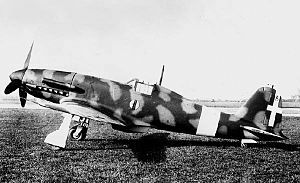 The ANR had two Gruppi Caccia terrestre (fighter squadrons), the first was initially equipped with the Macchi C.205, from November 1943 to May 1944, then, re-equipped with the G.55/I in June 1944 until it switched to the Bf 109G starting from November 1944. The 2nd Gruppo was the main unit equipped with the G.55, of which it had 70 examples from December 1943-August 1944, before being progressively re-equipped with the Bf 109G. With the ANR, the G.55s gave a good account of themselves against Allied fighters like the Spitfires and Mustang. In December 1942, a technical commission of the Regia Aeronautica was invited by the Luftwaffe to test some German aircraft in Rechlin. The visit was part of a joint plan for the standardization of the Axis aircraft production. In the same time, some Luftwaffe officers visited Guidonia where they were particularly interested in the performance promised by the Serie 5 fighters. On 9 December, these impressions were discussed in a Luftwaffe staff meeting and raised the interest of Hermann Goering himself. In February 1943, a German test commission was sent in Italy to evaluate the new Italian fighters. The commission was led by Oberst Petersen and was formed by Luftwaffe officers and pilots and by technical personnel, among them the Flugbaumeister Malz. The Germans also brought with them several aircraft including a Fw 190 A-5 and a Bf 109 G-4 for direct comparison tests in simulated dogfights. The tests began 20 February 1943 with the German commission very impressed by the Italian aircraft, the G.55 in particular. In general, all the Serie 5 fighters were very good at low altitudes, but the G.55 was also competitive with its German opponents in term of speed and climb rate at high altitudes still maintaining superior handling characteristics. The definitive evaluation by the German commission was "excellent" for the G.55, "excellent" for the Re.2005 but very complicated to produce and "average" for the C.205. Oberst Petersen defined the G.55 "the best fighter in the Axis" and immediately telegraphed his impressions to Goering. After listening the recommendations of Petersen, Milch and Galland, a meeting held by Goering on 22 February 1943 voted to produce the G.55 in Germany. German interest, apart from the good test results, derived also from the development possibilities they were able to see in the G.55 and in the Re.2005. Particularly, the G.55 was bigger and heavier and was considered a very good candidate for the new DB 603 engine, which was considered too large for the Bf 109's airframe. Other visits were organized in Germany during March and May 1943 in Rechlin and Berlin. The G.55 was again tested at Rechlin at the presence of Milch. Gabrielli and other FIAT personnel were invited to visit German factories and to discuss the evolution of the aircraft. The specifications of the German G55/II included the DB 603 engine, five 20 mm guns and a pressurized cockpit. The suggestion of weapons in the wings, limited to one 20 mm gun for each wing, originated the final configuration of the Serie I, while the DB 603 engine was successfully installed in the what became the G.56 prototype. As a concrete results of the German interest in the G.55, the Luftwaffe acquired three complete G.55/0 airframes (MM 91064-65-66) for evaluations and experiments providing three DB 603 engines and original machinery for the setup of other production line of the Italian copy of DB 605. Two of the Luftwaffe G.55s remained in Turin, at the Aeritalia plants, where they were used by German and Italian engineers to study the planned modifications and the possible optimizations to the production process. Later these two were converted to Serie I and delivered to the ANR. The third one was transferred to Rechlin for tests and experiments in Germany. The DB 603 engines were used to build the G.56 prototypes. The interest in the G.55 program was still high after the Armistice. In October 1943, Kurt Tank, who previously personally tested a G.55 in Rechlin, having nothing but praise for the aircraft, was in Turin to discuss G.55 production. However, war events and the not yet optimized production process were the reasons for which the G.55 program was eventually abandoned by the Luftwaffe. Early production of G.55 required about 15,000 man-hours; while there were estimations to reduce the effort to about 9,000 man-hours, the German factories were able to assemble a Bf 109 in only 5,000 man-hours. The DB 603 were instead to be used in Tank's own Ta-152 C.
The Regia Aeronautica employed torpedo bomber with success in the early war years, with the three-engine, SIAI-Marchetti SM.79 Sparviero medium bomber inflicting considerable losses on Allied shipping in the Mediterranean Sea. By late 1942 the aging Sparviero was facing continually improving Allied fighters and anti aircraft defences.leading to the General staff exploring the idea of using a fighter aircraft for torpedo attacks. A fighter operating from Italian coasts with an operational range of 300-400 km (190-250 mi), would be capable of delivering a torpedo at high speed and evade enemy fighters or engage them after the attack run. Fiat was asked to begin studies for a G.55 conversion to carry a 680 kg (1,500 lb) Whitehead torpedo, a shorter and more compact version of the standard weapon used by the SM.79. With the decision to develop a G.57, whose specifications included the capability of carrying torpedoes, all similar work on the G.55 torpedo fighter was suspended. The aircraft, designated G.55S, first flew in August 1944 and was successfully tested in January 1945. Despite the cumbersome external load, performance was good and the handling acceptable. The ANR ordered a pre-series of 10 examples and a production series of 100 aircraft, but the conclusion of the war put an end to the project. The G.55S prototype survived the war and, after being converted back to the Serie I standard, it became the first G.55 to be delivered to the newly formed Aeronautica Militare Italiana (AMI). The Fiat G.56 was basically a Fiat G.55 with a German Daimler-Benz DB 603 engine. Two prototypes were built, flight tests starting in March 1944. On 30 March, Commander Valentino Cus reached speeds of 690/700 km/h (430/440 mph). Official maximum speed was 685 km/h (426 mph) and the aircraft was armed with three 20 mm MG 151/20s, one firing through the propeller hub, the other two installed in the wings. While performance was excellent, the aircraft proving superior to both the Bf 109K and Bf 109G and Fw 190A, outmanoeuvring all types in testing, production was not allowed by the German authorities. In 1946, Fiat restarted production of the G.55, using the large stock of partly complete airframes and components remaining in its factories. It was available in two versions, the G.55A, a single seat fighter/advanced trainer, and the G.55B, a two seat advanced trainer, whose prototypes flew on 5 September 1946 and 12 February 1946 respectively. The AMI acquired 19 G.55As and 10 G.55Bs, while the Argentine Air Force purchased 30 G.55As, and 15 G.55Bs. The production of these orders for G.55s for Italy and Argentina caused the available stocks of the Italian licence-built version of the DB 605 engine to run short. As there was still a demand for the aircraft, it was decided to convert the type to use the more readily available Rolls-Royce Merlin engine, with the first conversion flying in early 1948. The conversion was successful, and the AMI decided to convert its G.55s to Merlin power, these re-entering service at the Lecce flying school in 1950 as the G.59-1A and G.59-1B (single and two seat versions). Syria placed an order for 30 similar aircraft, which by this time, were completely from new production as the stocks of G.55 components had been exhausted. Of these, 26 were single seaters (designated G.59-2A) and the remaining four two seaters (G.59-2B). A single G.59-2A was acquired by Argentina for evaluation, but no further orders followed from the South American republic. The final versions were the G.59-4A single seater and G.59-4B two seater, which were fitted with bubble canopies for improved visibility. 20 G.59-4As and ten G.59-4Bs were purchased by Italy. G.55/0 : 16 pre-production aircraft. G.55/1 : 15 initial production aircraft. G.55/2 : bomber interceptor version. G.55/S : torpedo attack aircraft model. G.55/A,B : monoplace/twin place trainer versions,developed after the conflict. G.56 : model with engine Daimler-Benz DB 603A of 1,750hp. Data from "Centauro - The Final Fling"
Arena, Nino. I Caccia Della Serie 5, Re2005, Mc205, Fiat G.G5 (in Italian). Modena, Italy: STEM-Mucchi, 1976. ISBN 90-70310-11-2. Arena, Nino. Fiat G55 Centauro - Fiat G59(in Italian). Modena, Italy: Mucchi Editore, 1994. Beale, Nick, Ferdinando D'Amico and Gabriele Valentini. Air War Italy, Axis Air Forces from Liberation of Rome to the Surrender. Shrewsbury, UK: Airlife, 1996. ISBN 1-85310-252-0. D'Amico, Ferdinando and Gabriele Valentini.Pictorial History of the Regia Aeronautica Vol.2 - Pictorial History of the Aeronautica Nazionale Repubblicana and the Italian Co-Belligerent Air Force 1943-1945. Carrollton, Texas: Squadron/Signal Publications, 1986. ISBN 87-981206-7-0. Di Terlizzi, Maurizio. Fiat G.55 Centauro (bilingual Italian/English). Roma, Italy: IBN Editore, 2001. ISBN 88-86815-35-2. Dimensione Cielo: Aerei Italiani nella 2� Guerra Mondiale, Caccia Assalto 3 (in Italian). Rome: Edizioni Bizzarri, 1972. Green, William. 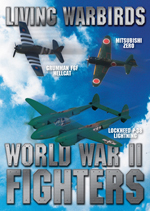 War Planes of the Second World War: Fighters, Volume Two. London: Macdonald & Co. (Publishers) Ltd., 1961. Green, William and Gordon Swanborough, eds. "Centaur - The Final Fling." Air Enthusiast International. Volume 6, Number 5, May 1974, pp. 233-239, 261-262. Green, William and Gordon Swanborough. The Complete Book of Fighters. New York: Smithmark Publishers Inc., 1994. 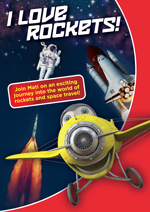 ISBN 0-8317-3939-8. Gunston, Bill. The Illustrated Directory of Fighting Aircraft of World War II. London: Salamander Books Limited, 1988. ISBN 1-84065-092-3. Jackson, Robert. 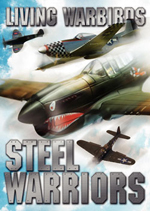 Aircraft of World War II - Development - Weaponry - Specifications. Enderby, Silverdale Books. 2003. ISBN 1-85605-751-8. Malizia, Nicola. Fiat G.59. Roma, Italy: IBN Editore, 2004. ISBN 88-7565-018-7. Mondey, David. The Hamlyn Concise Guide to Axis Aircraft of World War II. London: Bounty Books, 2006. ISBN 0-753714-60-4. Sgarlato, Nico. Italian Aircraft of World War II. Warren, Michigan: Squadron/Signal Publications, Inc., 1979. ISBN 0-89747-086-9. Thompson, Jonathan W. Italian Civil and Military Aircraft, 1930-1945. Fallbrook, CA: Aero Publishers, 1963. Vergnano, Piero and Gregory Alegi. "Fiat G.55." Ali D'Italia #10 (in Italian/English). Torino, Italy: La Bancarella Aeronautica, 1998. Winchester, Jim. "Fiat G.55 Centauro." Aircraft of World War II: The Aviation Factfile. Kent, UK: Grange Books plc, 2004. ISBN 1-84013-639-1.